This entry was posted in Inktober 2016 by Dana Burrell. Bookmark the permalink. I did, I did! I was out camping with the family and wasn’t expecting the rain from Hurricane Matthew to reach us. 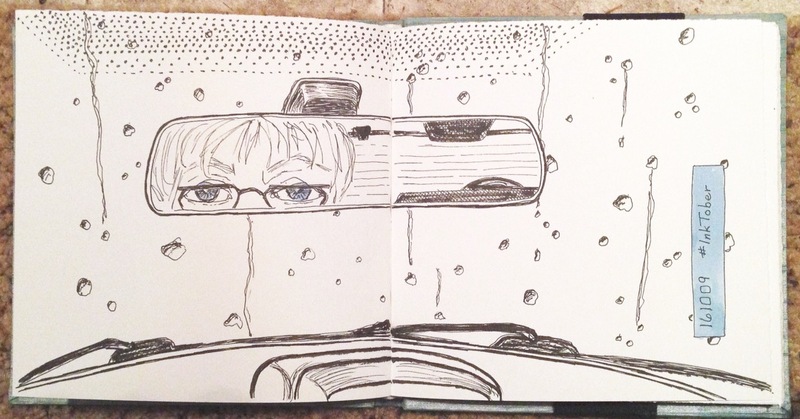 I was chilled and damp so I sat in the car with the heat on for a few minutes while I sketched. Believe me, warming up improved my mood immensely! I love my car! I sleep better in it then my own bed. Maybe it improves my mood at times too. Do you know how they come up with the names of a hurricane? What will the next one be named? Thanks! I saw a joke about Nicole following her boyfriend Matthew when he goes out of town. Now I get it.